I’ve even seen some schools adopt that design for their own shirts. “Property of Such-and-Such Martial Arts.” Students love that stuff, and I bet those schools sell them by the droves. 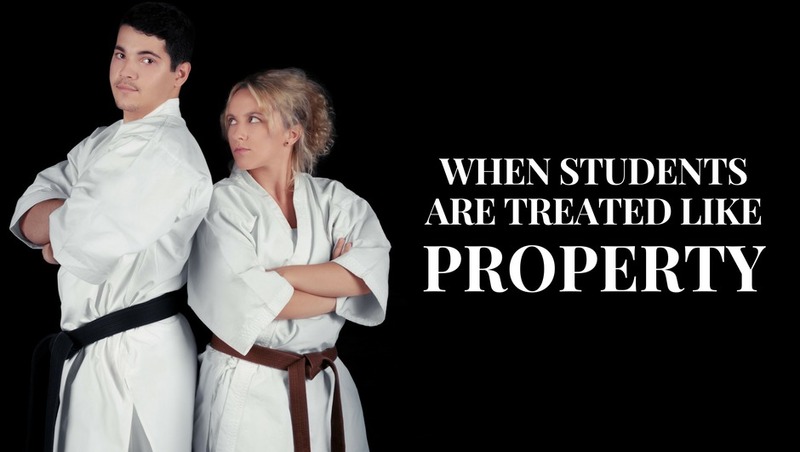 But what students don’t care for is when you really treat them like they are property of your dojo. Every once in a while, I’ll get an email from someone who is asking for my advice… someone who isn’t a school owner, but a student. Someone who is on the other side of the fence, as it were. Well, over the years I’ve realized that I’m not just a business coach; I’m also a consumer advocate of sorts for this industry. And, some of the stories students have shared with me have really pissed me off, on more than one occasion. For example, I was once contacted by a young man who was thinking about buying his instructor’s school. The only problem was, the instructor had convinced him that the school was worth about five times as much as it was actually worth. The instructor didn’t bother telling his student that, when you buy a business, you never accept the seller’s suggested price. Instead, you hire a business broker or accountant to do a valuation of the business, and then you negotiate from there. I did the math based on the numbers the student had sent me, and there was no way he’d be able to turn a profit in that school… at least, not with the astronomical loan payments he’d be making if he’d have purchased it at the asking price. Of course, his instructor was hacked at me for providing my honest opinion to his student. Me? I feel no remorse for keeping his student from making a huge financial blunder. Well, she noticed they were having trouble on the ground. So, she started taking them to classes at a BJJ school, for supplemental training. Note that she didn’t pull them out of their karate school. She feels a great deal of loyalty to their karate instructor. It’s just that she’s a mom who wants the best for her kids, and in this situation they apparently needed someone to teach them what to do on the ground. You can guess how this went. Now, the owner of the karate school is upset with her for taking her kids to another school, and he’s accusing her of disloyalty. Never mind that this instructor also trained some BJJ to supplement their karate training. Which tells you they’re a hypocrite, because obviously they didn’t learn BJJ from their karate sensei. They had to go somewhere other than their own karate instructor’s school to learn jiu-jitsu. Treating your students this way is patently ridiculous. We aren’t living in ancient China or feudal Japan. 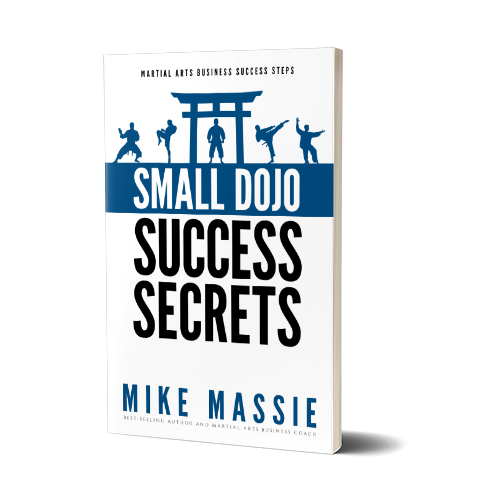 We don’t live under some sort of asinine and obscure warrior code… and if you do, that’s a self-imposed condition of living, and it’s not something you should force on your students. Besides, there are a million reasons why you shouldn’t get upset when a student goes somewhere else to learn something you don’t offer. For starters, you can’t be an expert in everything. So, when a student wants to learn something you don’t teach (or that you don’t teach very well), it shouldn’t bother you if they go train with someone else to learn it. If you teach traditional karate and they want to learn muay thai, you shouldn’t tell them things like, “Well, I can teach you kickboxing,” or “we do striking in our school, so you don’t need to learn that.” That’s crap. You know it, I know it, and the student knows it, too. They’re just not going to say it to your face, either out of respect or out of fear. If it’s out of respect, chances are good that soon they’re going to lose that respect for you, if you keep treating them like property. And if it’s out of fear? Well, no one in their right mind will stay in a dysfunctional relationship for long. Either way, you’re eventually going to lose that student. Another reason you shouldn’t mind it when students go other places to learn stuff you don’t teach is because it helps your school. Think about it — when they learn that stuff and bring it back to your school, it makes your school better because they are bringing new knowledge in. That’s good for your school. It’s also why the smartest BJJ school owners I know don’t get bent out of shape when their students cross-train at other gyms. Why? Because they know that when their students learn from other schools they are going to elevate their game. And when they bring new things back to their home school, everyone else is going to be exposed to it as well. Everyone wins, because it elevates the school as a whole. It’s only the insecure instructor who tries to keep their student from learning from others. Why? Because they’re afraid that what they teach won’t be good enough to keep that student around. And they’re afraid of losing that student’s money. So, my advice to you is to accept that you don’t have any right whatsoever to tell students how they spend their time and money outside of your classes. If you find out a student is training somewhere else as well, don’t be hurt or angry about it. Instead, be happy for them. They are learning and growing as a martial artist, just like you did coming up. And if they pursue additional training, it means that they are serious about becoming the best martial artist they can be. And, a good instructor only wants the best for their students. They aren’t threatened when their students train with other people. Instead, they’re interested solely in the growth of their students. Mark my words… if you want to keep students for life, learn to act in their best interests, 100% of the time. P.S. – Look up “creonte” if you’re not familiar with the term. That’s still a thing in some BJJ schools. Weird, but true. I don’t mind if a student trains at another gym…as long as they tell me! I agree Eugene. They should tell you about it. But if they don’t, you have to ask yourself if it’s because they don’t feel comfortable telling you they’re training somewhere else, too. That would indicate some communications issues that need to be addressed, as well as culture and atmosphere issues. I think some are embarrassed , or scared to say so. But the vast majority do tell me, so they feel like the disrespect the school. When I lived in Japan, I was told by a Japanese friend that I have to tell my instructor that I was going to train somewhere else. He told me if I didn’t I might not be able to return to train there if I wanted to. I even sent a thank you letter to my teacher for all his knowledge. So you are correct, there is a cultural aspect to it too. I can see that happening in Japan. I think the mistake instructors in the West make is assuming their Western students should follow Eastern cultural norms. That’s for sure…some forget where they are living. Always great articles sir! I would be interested if you could write an article about students who get injured, in or out of the dojo, and how does one deal with their payments. Do we freeze it? or let it go….